In 2018, 7 Mile House initiated presenting the first annual set of 7 Mile House Jazz Festival Bay Area Jazz Recognition Awards. The Bay Area has been and is filled with an amazing amount of this music, and the great jazz scene is thanks to the talents, hard work, and dedication of a huge cast and crew of amazingly talented players, presenters, promoters, and listeners. 7 Mile House is pleased to take this opportunity to celebrate the region’s great jazz, recognizing just a few of the wonderful people who make all this possible. 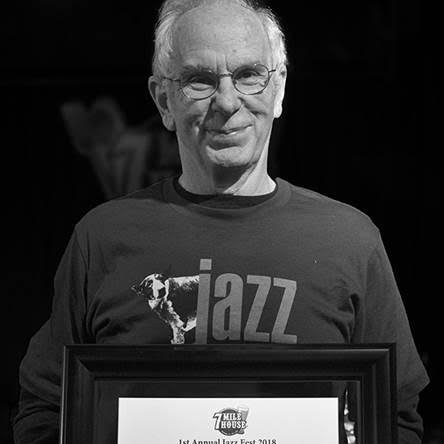 During this first annual festival at the 7 Mile, people in three categories were recognized: Outstanding Jazz Presenter, Outstanding Jazz Promoter, and Outstanding Jazz Musician. Live jazz is heard in the Bay Area because some people arrange the venue and hire the musicians – these are who we call “jazz presenters”. The main reason that listeners fill rooms like this is because of the people we call “jazz promoters” – the people who advertise and promote and spread the word about the performances through the print and on-line media and on the airwaves. Vince Lateano is everyone’s favorite drummer on the Bay Area scene. Vince great up in Sacramento, and he learned to be a trumpeter first and then a drummer thanks to a great music program in the public schools he attended. His first serious drum teacher was Stan Linetta, and Stan really inspired Vince to become a serious player who ended up having lots of fun with the music throughout his life. To give you a sense of his fellow students at the time, his buddy was and is the great, and now world-famous, jazz bassist Rufus Reid. Vince became a member of the musician’s union in Sacramento before he was 16 years old, because he was gigging so much at that young age. His first serious band was led by honking tenor saxophonist Gene Morris, and he played with lots of other greats on the scene there before moving to Tucson for two years in the Army at Fort Hauchuca, where he was drafted as a musician and spent tons of time practicing and playing, including gigs in town, especially with pianist Micky Grecco. He got out of the army just before Vietnam began, and he moved back to San Francisco, where he’s been ever since. He has played with numerous artists all over town and out of town over the years. Most notably, he had long stints with another Vince, the great pianist Vince Guaraldi, and even longer with vibraphonist Cal Tjader. Of the various configurations of bands Vince was in with Cal, maybe the most significant was the “Modern Mambo Quintet”, which also featured Mark Levine, Roger Glenn, Rob Fisher, and Poncho Sanchez. The list of artists with whom Vince has recorded is staggering. In addition to Vince Guaraldi and Cal, the headliners include Carmen McRae, Mark Murphy, Kitty Margolis, Stephane Grappelli, Tania Maria, Jacqui Naylor, Flip Nunez, and Bruce Forman. Such a versatile musician, Vince has also recorded with some animals, including the Turtle Island String Quartet and the Nuclear Whales Saxophone Orchestra. And the most important collaboration of all for Vince, no doubt, is with his wonderful wife, the great jazz vocalist Madeline Eastman, who is also his link to the entire world, since Vince so far has resisted using email, and Madeline handles that part of their life at home. 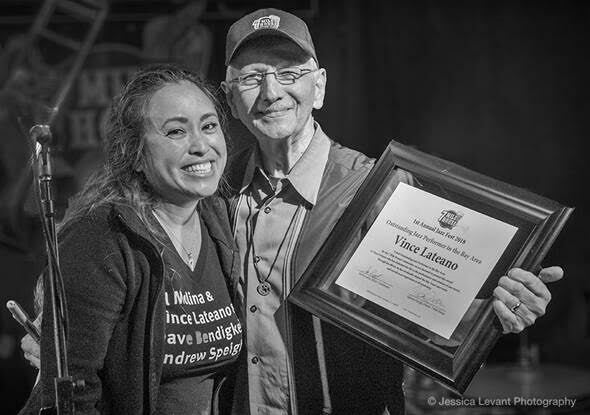 It is with the greatest of pleasures that the 7 Mile House presented this award for Outstanding Bay Area Jazz musician to the GREAT drummer, Vince Lateano! Very few people in the Bay Area have worked as tirelessly promoting great jazz in the Bay Area as Andy Gilbert. Andy is originally from Los Angeles, was educated at UC Santa Cruz, and fortunately for us, moved up to Berkeley and has been writing about area goings-on vigorously for many years. In addition to major area publications, such as the San Francisco Chronicle and the San Jose Mercury News, Andy’s writings have appeared in the Los Angeles Times, the Seattle Times, the Contra Costa Times, Metro Times, The Monthly, Oakland Magazine, Alameda Magazine, and the Boston Globe. He has been heard regularly with CD reviews on KQED. And his columns appear in the San Francisco Classical Voice, Berkeleyside, and many more outlets. A great example of Andy’s contributions to jazz in the area is his essay published on the website San Francisco Classical Voice celebrating the tremendous talents of composers living in our area and calling on the jazz institutions of the community to commission and present more original work to showcase these talents. Andy is a member of the Board of Directors of the Jazz Journalists Association, a great honor. And he has been a major player in the Jazz Journalists Association Bay Area Jazz hero Awards. Without a doubt, the most important project for Andy in recent years started with the birth of his daughter, who is a major focus of his love and affection. We in the jazz world are lucky that there is room in his heart for us, too. 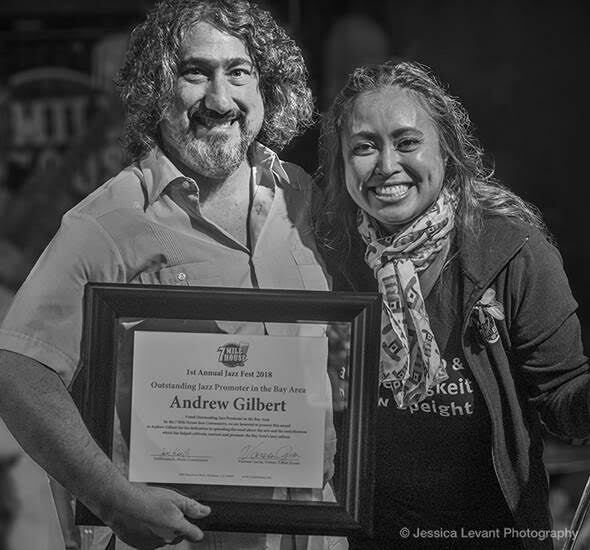 We are pleased to present this award to Andy Gilbert! Mario Guarneri is the Founder and Artist Director of “Jazz in the Neighborhood”, an exciting and innovative organization that is changing the lives of jazz musicians and performance presenters throughout the Bay Area in a creative and unprecedented way. We are so pleased to honor Mario’s creative thinking and tireless efforts with this recognition. As a musician, Mario has “done it all”, from playing Dixieland jazz with Louis Armstrong at the age of thirteen, to fifteen seasons playing trumpet with the Los Angeles Philharmonic, under the batons of Zubin Mehta and Carlo Maria Giulini. He has toured Europe with the Los Angeles Brass Quintet and performed with the New York Philharmonic, the San Francisco Symphony, Radio City Music Hall and even the Barnum and Bailey Circus. Mario has recorded solo albums on the Crystal and Nonesuch labels, one of which was nominated for the Prix de Rome.